The more I work with plants, especially native plants, the more I realize that the real goal is not simply replacing lawn and consuming less water. 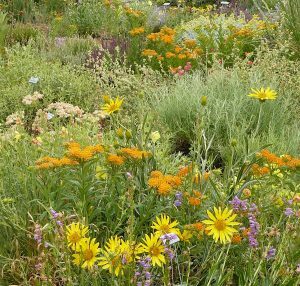 The real goal is creating Habitat: Habitat for bees, butterflies, moths, beetles, myriad other insects–and birds. (Build it and they will come!) A landscape that is truly a Habitat buzzes with life. It changes with the seasons. It evolves from year to year, always revealing new surprises. It creates the opportunity for new insights into the natural world that is everywhere around us. It is not static. There are many rewards for the gardener who creates Habitat, one of the best being that the Landscape becomes Habitat for humans!